The image shows a figure, presumably Dr. Oldfield, seated on the veranda; his children Lilian and Edmund in the foreground with an ayah and a bearer. A photograph, presumably of Margaret Oldfield, the Residency Surgeon's wife, and one of her children, in a carriage, has been attached to the mount. Dr Oldfield was Residency Surgeon at Kathmandu from 1850-1863. 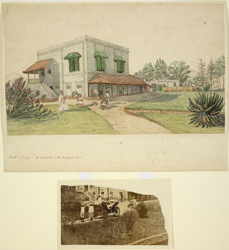 After his death his family published his 'Sketches from Nipal, Historical and Descriptive...' (1880) in two volumes, which described life in the court of the Maharajah Jung Bahadur and also contained descriptions of Buddhist architecture, together with illustrations from Oldfield's own drawings.